The combination of Mundial's unique, soft-textured Mundigrip material and their new multi-function handle design allows for a comfortable and secure grip when using. The high-carbon stainless steel blades were designed to provide a smooth cut of most surfaces and materials. The take-a-part design makes cleaning easy. Uses include: cutting herbs, stems or fins, opening bags, trimming parchment or freezer paper, cutting box tops or twine or even opening up plastic clamshell retail packaging. 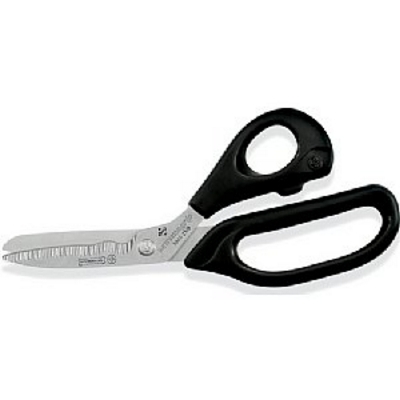 Shears feature Sanitize Brand antimicrobial agents added to the handle to reduce the growth of bacteria or mold. Used extensively in the food service and meat processing industry, Sanitize Brand antimicrobial protection aids in reducing the likelihood of harmful bacteria growing on the shears handle and cross-contaminating with other products.